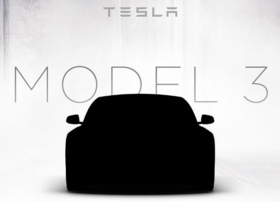 In invitations to current Tesla owners, the company revealed the first glimpse of the silhouette of the car. (Bloomberg) -- Tesla is preparing to unveil its $35,000 Model 3 electric car on March 31. The company has revealed a few key details in invitations sent to owners and the media. First and foremost: There will be a working prototype on site. CEO Elon Musk previously indicated he might not show the full car, which isn't expected to go on sale until 2017 at the earliest. A drivable version at the event might indicate the company is further along than some investors thought. This is Tesla's most important car yet, intended to bring the success of the Model S in luxury markets to a much wider audience. The company's previous cars have missed their production deadlines, but Tesla has said it has learned from past mistakes and is focused on getting an affordable Model 3 on the road as soon as possible. In invitations to current Tesla owners, the company also revealed the first glimpse of the silhouette of the car. Musk had previously described the car as similar in size to the Audi A4, a midsize sedan that competes with the BMW 3 series. Tesla has described the car as being roughly 20 percent smaller than the Model S, which is now the best-selling large luxury vehicle in the U.S. The event will be held at the Tesla Design Studio in Hawthorne, California Fewer than 800 people will attend, including 650 spaces reserved for current Tesla owners and their guests "as a token of our appreciation for your support," according to the invitation. Spots will be allocated by random lottery on March 16 to current Tesla owners who enter the drawing online.